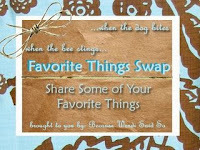 I participated in my first online swap, a favorite things swap, hosted and organized by Because Wendi Said So!! Thank you, Wendi, for all of your hard work. It was so much fun! My swap partner was Jennifer of Living Life Moment by Moment. She was so sweet, creative, and generous with her swap gifts that I feel like I didn't do enough for her. Jennifer really went above and beyond expectations! She selected some of her favorite things based on my favorite things, too. She wrapped each item separately in the most adorable paper, and she labeled each gift with the "category" for which it fit as one of her favorites such as "travelling." She also sent a typed note telling me why these are her favorite things and a handwritten gift enclosure, not to mention a little "extra something" which will come in handy due to the hurricane. Thank you so much, Jennifer. Here is a photo of all of my gifts! Fuzzy Socks - 2 pair, lavender and purple. They are so soft! Calendars - a pretty lighthouse calendar. I, too, like planning and being organized. Notecards - Very cute! I like to send handwritten notes. Chocolate - A box of Swiss Miss Instant Hot Cocoa (yum! ), and a dish towel and hot mat that say "chocolate." Cute AND useful. Candles - A box of 12 candles, 4 each of three fragrances. I've been enjoying the aroma of pumpkin pie all day. Lists - An adorable notepad. I'm a list person, too. Photography - Two black picture frams. I love to display my photos. This was an awesome experience, and I would definitely participate again, and I would try to be as organized and clever as Jennifer. Thanks, again, swap partner, for the great gifts and for showing me how to do this creatively! My son wanted me to be in the picture with the gifts, so here ya go! Isn't swapping fun? I love doing swaps and meeting even more fun people. WOW!!! i wanna play. how did she oragnize it all? maybe i will do it on my blog. gotta love a good idea! Such gorgoeus gifts Diane, it would feel like Christmas early. You got a lot of great things! I love the travel bag! Swapping is so much fun!! What fantastic goodies you received.